What sites have advertisements enabled? Which doesn't seems to be mentioned in the advertising program list. Are there sites that have ads enabled yet not documented (apart from the trilogy)? The last media kit update appears to have removed the additional sites that we've added advertising to - this has been corrected. The same rules apply to these sites. We aim to keep all advertising as relevant as possible. We do not work with ad networks or sell inventory at remnant rates. Not the answer you're looking for? Browse other questions tagged support advertising . Are there any ads on the SE network? Where are the alleged advertisements? Does the reduced advertising privilege exist on non-trilogy sites that carry ads? 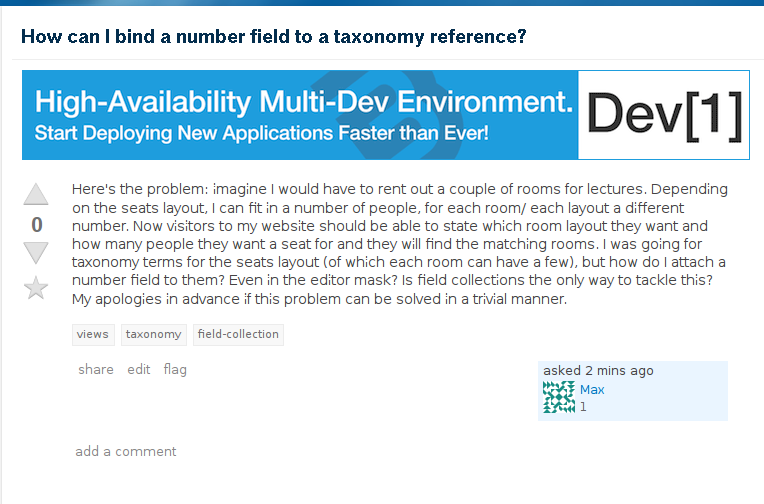 Why not introduce a donate button in Stack Exchange sites? How to advertise on non-developer SE websites? Java File API ad on Gaming.SE? Why are the “Trilogy” Stack Exchange sites the only ones that display ads? What criteria determine whether a Stack Exchange site should carry ads? Is the list on selfserve-stackexchange.com the complete list of sites that carry display ads?